Welcome back John and thanks for the update. As you know im still bullish. Do you have an exit plan should market continue higher next year? Thanks. Reduce exposure, stay in the game. Good to know. By the way that allocations chart scares the hell out of me. We are close but not quite there imo. My argument is stocks have risen by price not earnings and economic growth is so weak that central banks had to act again this year. The solar max did the mania not the CBs. On verra. The price will determine. Another arbitrary mantra repeated over and over is that valuations are cheap compared to 2000, a point in time universally considered overvalued. It is idiotic. Welcome back John Hampson. Didn’t say it wasn’t idiotic. John may be right or he may be wrong. But he has been wrong in recent months. Welcome back John! and Thanks for the beautiful charts. Dec. 26 was a Bradley turn date +/ – a few days. McHugh has a target for the SPX to be about 2,100 – 2,150, not too far away. Looks like oil according Elliot wave charting is starting a wave 5 down and has more to go, which could freak the markets out. To repeat what I have said before, until/unless these measures are reset without a crash, then history dictates that is the most likely outcome. Crashes don’t occur often, but when they do, the set-up looks like the current. I agree ‘its NOT different this time’. My Best Wishes to yourself and ALL here for 2015. Welcome back, John and season’s greetings to all. Long gold but not in a big way. Still open to possibility of a final move down sub-$1k later this year. Looking to see if I get a miners long entry this week tho. Had a look at the Sunspot chart above but a bit confused. 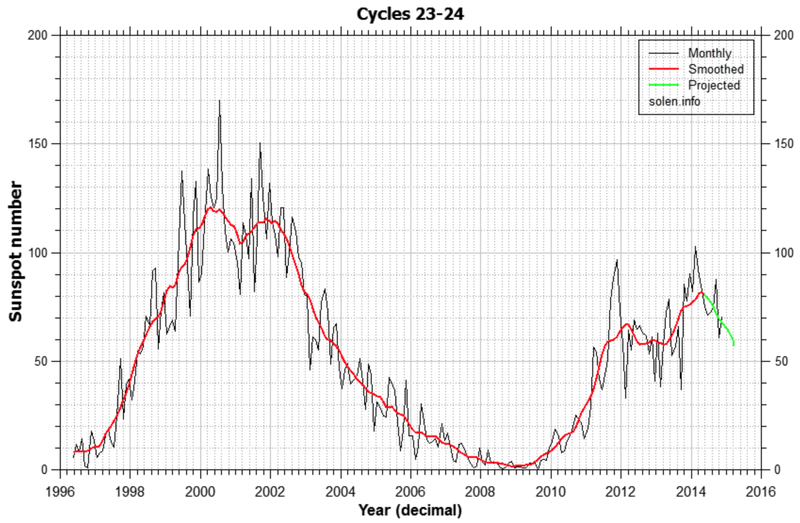 Why is there hardly any sunspots near 2007-2009 crash. Apologies if this is a newbie question as its not an area ive studied in any detail. It was the 19 year cycle crash of the Earth, Moon, and Sun considered in only two dimensions. (South Sea Bubble, 1929, 1987, and 2007). With respect John, one other point. IMHO, I think 2015 will be one of the toughest and least predicatable years. I say this as I think the first half will frustrate both bulls and bears. With possibly the sexond half being bias towards the downside. BTFD is the new CB subsidy/welfare program for traders and investors. It’s purpose is the promote the illusion of prosperity and confidence. CB’s have your backs, right! Investment genius is a short memory in a rising market. How much longer? John’s #3 “Deflation in charge”. Right on! 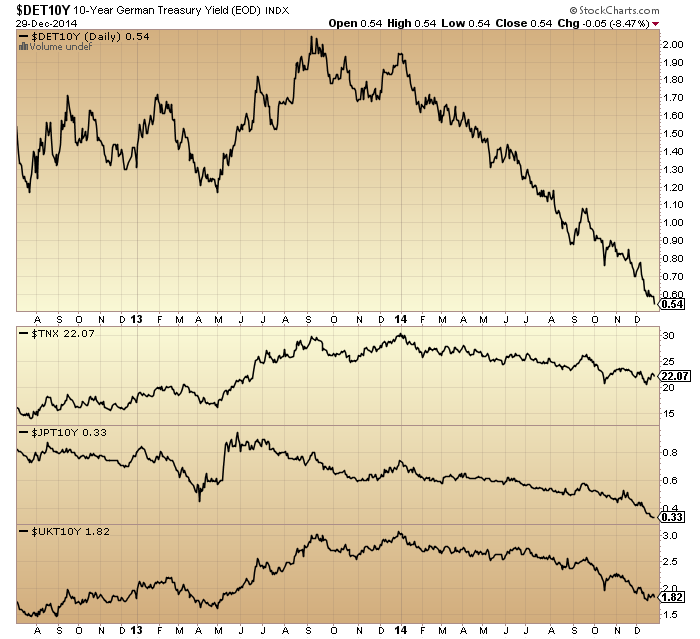 All CBs aren’t doing enough to counter deflation. so my simple logic says we will see a panic (crash of 20+%), and the CBs bring out their nuclear devices…that will also reset the deflation/inflation debate. What a mass. All cause by too much debts accumulated that needed to be deleveraged. But let price be your guide when the panic will come. The ASSETBULL:ASSETBEAR chart under point 7 above shows a current reading of 19. That’s a strikingly sharp increase recently, but given that it’s a simple ratio of bull assets to bear assets, what’s to stop it going higher? Potentially much higher? And the BULL:RYRATMM chart under point 13 is showing a current reading of zero. Is that just a false reading? Mark, I believe the point John is demonstrating is the ‘extremes’ to which these measures have been stretched compared to history. I appreciate that purvez. I am not criticising the use of these charts. 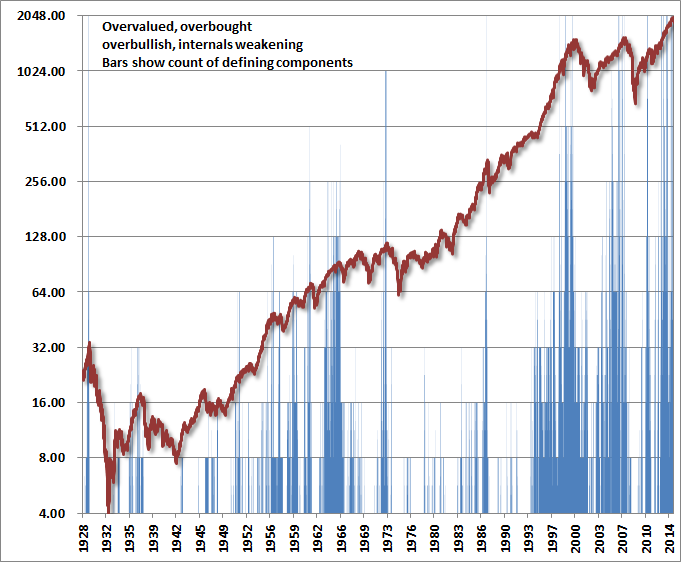 I’m suggesting that, rather than look at the likes of the ASSETBULL:ASSETBEAR chart and think “I’m not aware of that happening before, it shouldn’t be happening, and must correct itself”, that it is more prudent to ask “why is that happening now?”. Comparing things to history means going back a lot further than 1998. These measures are only stretched compared to very recent history. There have been times in the past when assets increased by thousands of percent within a year or two. It can go to infinity, so perhaps we should invert and calculate BEAR:BULL instead. I am not sure what is in the fund. For a short term bond fund, if the expenses exceed the yield, it would be very rational to redeem completely even if you were a bear — cash is better. I like your proposal to invert the chart – we humans see something surging upwards and instinctively feel that its unsustainable. When we see something surging downwards, we find it very easy to extrapolate it to zero! The Bull:Ryratym zero is false, don’t know why it says that. It reached its peak-to-date in 2014 in Dec. I have no good alternatives to explain 2014. (ii) We are in the unlucky 10% of the time where there is no crash. From SC1 to SC23, I could not identify crashes in 1778 and 1959. (And perhaps there WAS a crash that I don’t know about. I know of the Kennedy Flash Crash of 1962, but did not attribute it to SC.) However, valuation/China/leverage would have to be explained. (iii) This crash will come as one of the latest ever in the cycle. It has already exceeded 1873 and 1929. This brings us to SC1 where the crash would be projected to be 2015-2016. I am not saying that this will be SC1 — we could crash at anytime I suppose. Just that for the 23 datapoints, I see 21 crashes and of which 20 crashes indicate that we should ALREADY have peaked. None of this is convincing. Pick your poison? Regarding SC1, 1759 would look like 2011. The crash was the Amsterdam Loan and Banking Crisis in 1763 (~2015). My date is the date of the CRASH — I don’t have the date of the PEAK, which could have been earlier. Let’s say 6M earlier, but I am being generous here as the bears have little ammo left for error. Perhaps someone knows the date. China is late to the “Shadow” banking game…it has been around since SC1. Thanks John. Yes some things are anomalous this time. The full assessment needs more hindsight yet. 1) The max has not yet occurred. It will occur in 2015 or 2016. 2) The crash did occur and it was in oil and other commodities. You are right. Adding your two options in, we have five, but still no good choices. 1) Scientists expected a solar max in 2011 or 2012, so option #1 would be abnormal as well. In addition, I based my time window on an average of indicators, such as a polar inversion, which has already occurred in 2013, or the time from the solar minimum. These should not change even if the solar max does change. 2) Perhaps the crash was in gold too. That feels wrong to me, because I did not detect the euphoria for gold or oil. But at this point, I accept any possibility. I haven’t lived long enough to know if there was euphoria in every solar max crash — it is just our hypothesis. I was involved in gold during 2010 and 2011, and, believe me, among gold traders there was euphoria! Gold’s going to 5,000, gold’s going to 10,000… you get the idea. Crude’s big runup was in 2008, so on second thought it probably doesn’t qualify, if you need both a euphoric top AND a crash to qualify. Gold would qualify but the timing is a bit early, having peaked in 2011. Newt, I’m onboard with#3 deflation as well. In 2007, Housing/subprime was falling apart and few paid any attention. Now, deflation is very pronounced in oil, commodities, Europe, plus the deflationary effects of the economic collapse in Russia, Iran, Venezuela, developing world. It is all interpreted as positive. I expect similar results like 2007 next year. I expect the turn now, but acknowledge it could go all the way to the fall. One could easily see crashes from fundamental economic deflationary factors, immediately followed by CB’s panicing to save the day. The big panic will be when the realization that QE INFINITY does not work. so if and when you short a panic, you must take your profit quickly. CBs can’t allow the confidence to be broken. They will destroy the shorts. The mirrors from history took 2-8 weeks, so very swift crashes/panics. I don’t see CBs can stop the forced redemptions washing through once they start. No doubt they will act, but I don’t think they can stop it. In early December Gold failed at its 100 day ma. This time, will it break above its 100 day ma or fail and set back for the second time to new lows? Is February’s Gold futures rallying to retest its 100 day ma a warning that Stocks are about to decline in a meaningful way? Even though Gold’s 50 day ma is below its 100 day ma which is below its 200 day ma, when it touched its 100 day ma and set back in early December it did not break to new lows even though it did fall below its 50 day ma. 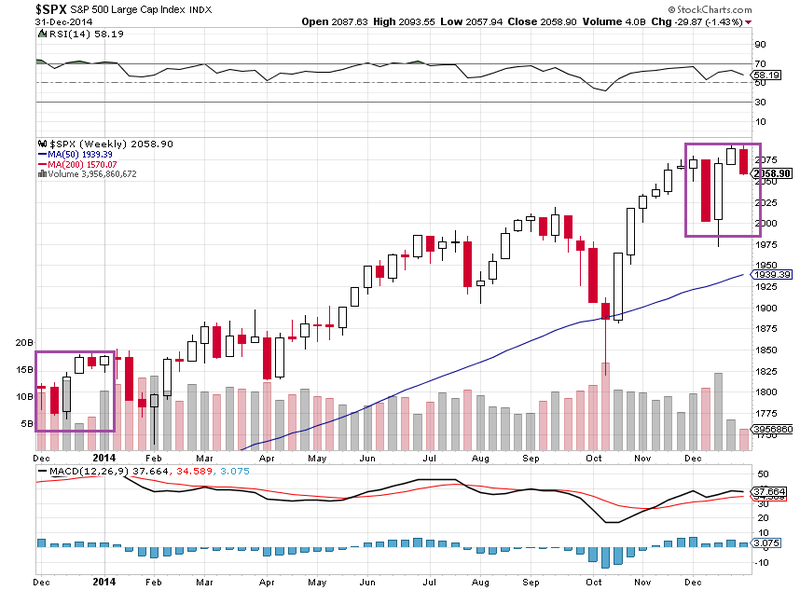 Now it is back above its 50 day ma and looking to retest its 100 day ma once again. All this recent price action in gold may be pointing to a serious decline in stocks is at hand. Even in severe bear markets like gold and oil now, you get bear market rallies above the 100 day and even the 200, but it ia still a bear market. The first major bear market rally is not due until the end of 2016. Prechter of Elliott Wave, Rosen of Delta, and Flannagan of Gannglogal are all bullish on gold. If all three of tjose guys are right at once, it would be a new era. So far today the big movers are Gold and Yen are up and stocks are down. Hmmm….seems to me that something is afoot. Another aspect of simply ignoring the bad news of deflation. S&P IQ expects a 21% drop in oil company earnings. Another is the strong dollar will blast earning of major internationals, one of the strongest groups. With the market at all time highs, apparently nothing to worry about. Sharing one(1) tool. $NYLOW currently at only 28. At this level, there is no TA basis to justify initiating a short today. The market is doing its “healthy” consolidation. The market is teasing John’s work until it is ready to plunge. Nice to see you again, John. Welcome back John, I wish you a happy and healthy new year. I wonder if this explains why the markets haven’t yet rolled over? Any solar experts have an opinion on this matter please, which would seem to be very important for establishing short or long positions? 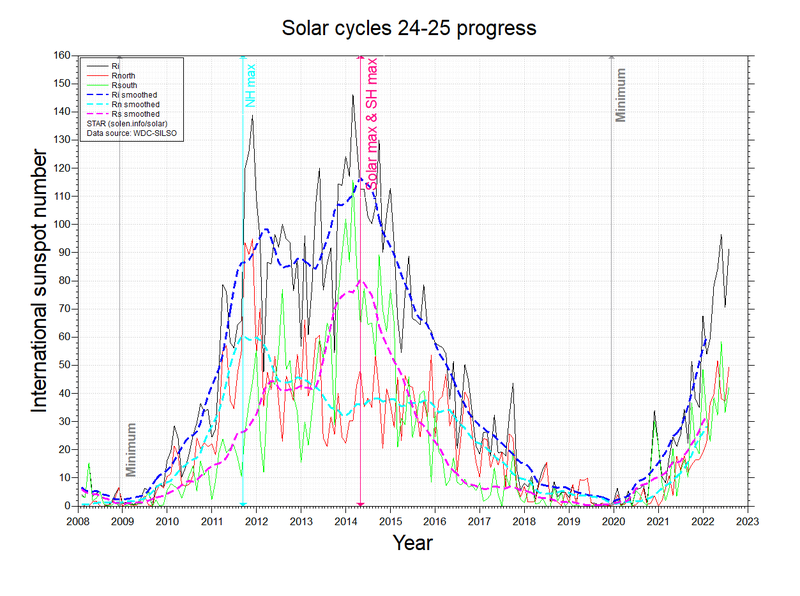 How/when exactly does one definitively know the solar cycle has turned down for good (is it only in hindsight I wonder)? PS…the FTSE firework is now falling gracefully back to earth, hooray for gravity! Thank you. We need more hindsight to be sure the solar max has passed. Just working on probability. Happy healthy New year to you. Yhank you for all the insights you and the site have provided. GM, for SC1, I had mentioned the Amsterdam Loan and Banking Crisis in 1763. That would be the longest wait of all SC1~23 with the exceptions of the two non-crash scenarios. However, the red line was not updated past where the correlation broke down. The black line here equals the same red line, and shows that we have turned lower. thanks for posting this. it is in line with the top still ahead of us! GM – you need to decide what measure of solar maximum to use, if you’re going to use it for timing purposes. For example, the SC1 chart you posted quotes “SSN” (ie. the Smoothed Sunspot Number) but it in fact shows the ISN (International Sunspot Number, which are monthly numbers). The timing between them can be very different. In SC17 the SSN peak was May 1937 and the ISN peak was July 1938 – if you’d shorted US stocks at the SSN peak you’d have made a lot of money. 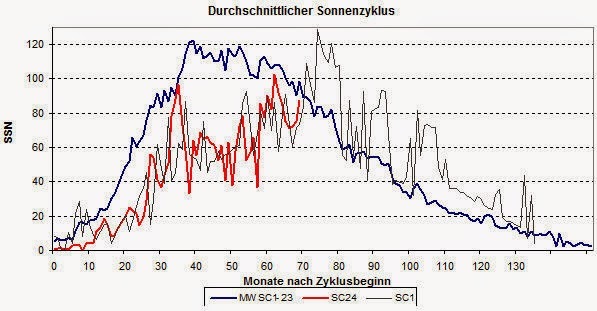 John Li has already pointed out that the red ISN line in the SC1 chart is a couple of months out of date (having since dropped to 60, then bounced to 70). But tomorrow’s new ISN will show it back just above 80 again – so the SC1 comparison is still valid. But my own view is that ISN will more likely stay within its current plateau range between 40 and 100 for most of 2015, rather than reach new highs (I base that on cyclical magnetic models which have been reliable so far, and also the current downward trend in neutron counts which probably doesn’t have much further to go). My view is that when ISN eventually drops out of its plateau, then the rug will be swept from beneath the current speculation. Respect to Mark for promoting an alternative to my own. We are working this out as we go along. Shorting the Dow at 185 during mid 1937 SSN max would have been very profitable. Shorting it at 220 mid 1928 SSN max would have been the opposite. Absurd as it may seem, but I still believe there is an 80% chance we will soon witness a 1928/29 style bubble in US stocks. Agree 100% to what you said. I consider you technical expert when it comes to understanding of sun :-). Mark, I too had always assumed SSN just meant the generic term for “sunspot number”. Thanks for clarifying. Is it often true that SSN peaks before ISN? Can you point to where I could get the ISN data from 1929? Yes, SSN has aften peaked before ISN in the limited 23 examples we have to go on. That’s why I don’t attach so much importance to SSN timing in a weak cycle. My interest is more academic, as I don’t trade, rather I position funds for the cyclical changes, and ultimately for the deflationary collapse that cannot be rescued by the CBs, but is likely to result in hyperinflationary outcomes, and a reset to a new global monetary system. Hence, gold is really the only option, as it becomes the only safe asset in a deflating world where currencies are being destroyed. Highly likely that it will be used once more for settlement purposes IMO in the next system (so no more debt build up at a sovereign level), and it’s an easy buy/hold for the long haul. I always stress that I refer to real physical gold, paper positions will fail in the currency collapses in my opinion, counterparties won’t be able to pay you, so I buy the real thing. The world faces a hellish 3-5 years, I just hope we avoid WW3 en route to the other side. All of that makes perfect sense to me. Biochemical war to world harmony. 2014, a year that will live in infamy. I just read David Stockman’s Commodity Prices are Cliff-Diving Due to the Fracturing Monetary Supernova. It explicates the incredible over investment in the mining industry and how the decline has only just begun. I think a good analogy would be most are mistaking the beginning of a supernova with a coronal mass ejection. The supernova is the massive money printing had no where else to go in 2014, as real estate and commodities had been broken, so it went into stocks blowing them past all previous top signals like a tsunami at spring tide. one man’s opinion. Money printing has been going on since our present banking system came into being back in the early 20th Century. Most of the money printing was done by member banks, not by the Central Bank. Whenever a bank loans money it does not have, it “prints” money. Banks generally loan many multiples of their reserves, so they are the culprits, they are the money printers. The “money printing” of late that’s been done by the CB’s is a drop in the bucket compared to the money printing from all the member banks, so I can’t get too excited about theories like Mr. Stockman’s. As I said, it’s just one man’s opinion. There are many other well educated economists who believe Stockman’s conclusion is incorrect. True. There is around 3% cash and 97% debt in the money system. If everyone in the country decided to withdraw their savings on the same day only 3% would get it back due to fractional reserve banking. The difference here is that banks can only ‘print’ money when they receive deposits or raise funds from the interbank market. Central banks do the ‘printing’ as they wish,… Simply out of thin air! Banks create money out of thin air by loaning out money they do not have. They are required to keep only a fraction of their outstanding loan debt in the form of cash reserves. That’s why it’s called fractional banking system. A bank has a million dollars in cash. They can loan out 20 million or 30 million (whatever the current multiple allows). So they end up creating (printing) 19 or 29 million dollars. It’s the banking SYSTEM, not the Central Bank, that is responsible for the dollar losing 97 percent of its value over the past 100 years. The banks create money out of thin air, more money in circulation means more dollars chasing after goods and services, the dollar is worth less and prices rise. John, I believe you mean that only 3% would get it back in ‘physical’ form. Of course all 100% would have it in electronic form anyway. Given today’s technology driven transaction system the electronic form would be the preferred method of ‘holding’ cash. That is why I believe ‘bank runs’ are no longer an issue. Now if you want to talk about ‘counter party risk’…..that’s an entirely different topic, although not very far removed from ‘fractional banking’. John, you mentioned you were long gold. There is an article over at marketoracle with a prediction on gold over the next year. 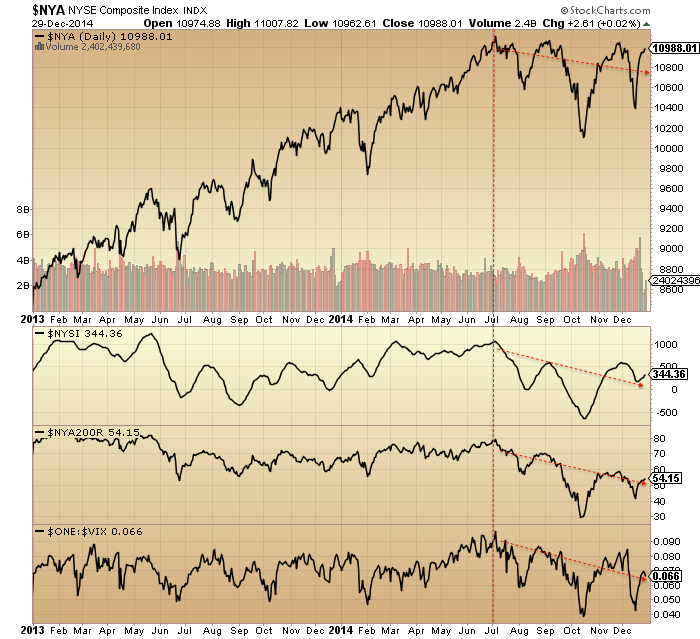 The author is predicting down to 1050 then rally but nothing to strong. 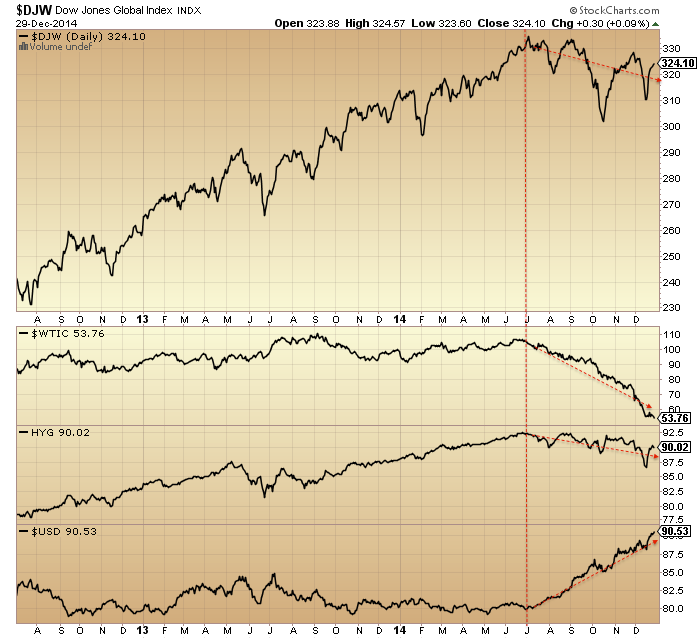 The author has been consistently correct in calling stock markets and remains a bull. I can’t be as sure about my gold prediction as my short stocks, due to the limited history of gold performing under deflation. But I see gold as the best long investment out of a very limited choice. Still points to a second chance peak. I actually wonder if 9/1929 was a second chance peak too. Both 9/1929 and 12/2014 are at ATH, but I am referring to the matter it unfolds thereafter. Very interesting question John Li. A perspective that could change the way one thinks about this lot. Thanks for that. Not sure if I am really helping. It has been a tough year, and we are back to Jan 1st a year later, thinking the peak will be “soon”. John, good to hear you are feeling mentally refreshed. will become apparent as the US earning cycle ultimately turns. Timing this precisely is exceptionally difficult as always. NYSE going down last 2 days but 52 week highs going up. Duncan on downside bias for Q3/4. may combine to bite on many US multinationals. distribution costs – this may be currently underestimated. 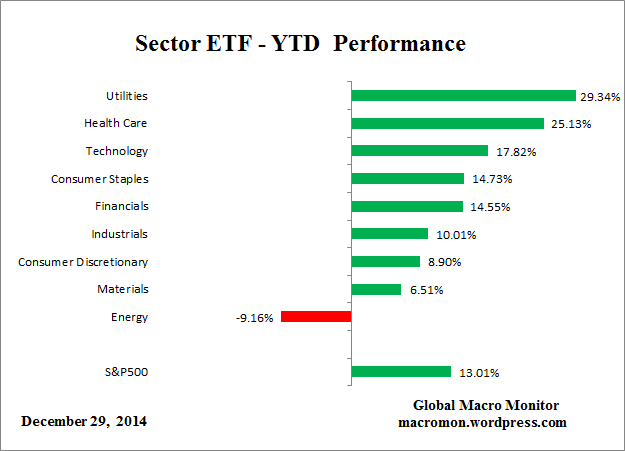 to a major equity ’15 top, followed by a new bear market. Thanks Phil. A bear market starting next year would be my guess but thats all. Based on cycles my thoughts are a cyclical bear should run for a bit longer. However, I only trade what I see and right now I cant see much in terms of bearishness from an economic perspective. As an example, the margin debt chart above certainly shows a peak early last year. However, it should also be noted that each bear market was quickly followed by a recession. It certainly doesnt feel like the US is in recession or approaching one. Have a look at Chris Puplavas recent articles which shows cur a 1% chance of recession. I continue to struggle with the ‘net positive’ outcome because globally someone (oil producers / producing countries ) is losing for someone else to win. I think I would agree with jegersmart that its net positive for developed non oil producing countries. Not sure how we would calculate whether it would be a “major net positive globally” , but it should certainly be good for developed countries not overly dependent on revenues. Certainly it can and is causing destabilisation if it persists on a more medium term which may be a bonus for the more predatory countries like the US. How it affects the artificial world of markets we will of course find out, however I am ready to start building a long position in oil, at least in tranches. Good luck all and Happy New Year to all. Time to revisit the 1921-1929 analog to 2009-2017? From time to time I like to revisit the daily price patterns. In 1926 (=2014), the Dow fell 2% the last week in Dec and an additional 3% in Jan for a yearly low Jan 25, 1927 (=2015). This would be about SPX 2000 (125 dma). The market regained its high by the end of Feb, Was flat thru Mar, then took off in Apr to reach Dow 200 (x100 = 20k today) by mid-Dec. This roughly fits in with the inversion of the 2015 Bradley turn cycles hat I predicted last Oct. Step 2 of 4 for melt-up scenario is full ECB QE by Apr. Thanks arthurk. Mark was also making reference to a possible 1928/29 meltup with reference to solar cycles. Mark, would appreciate your insight on which year in that cycle we could compare 2015 against? What I see as key to the melt-up in stocks is what happens to bonds. There was a great graph posted several years ago that leads up to the bond crash of 1932. 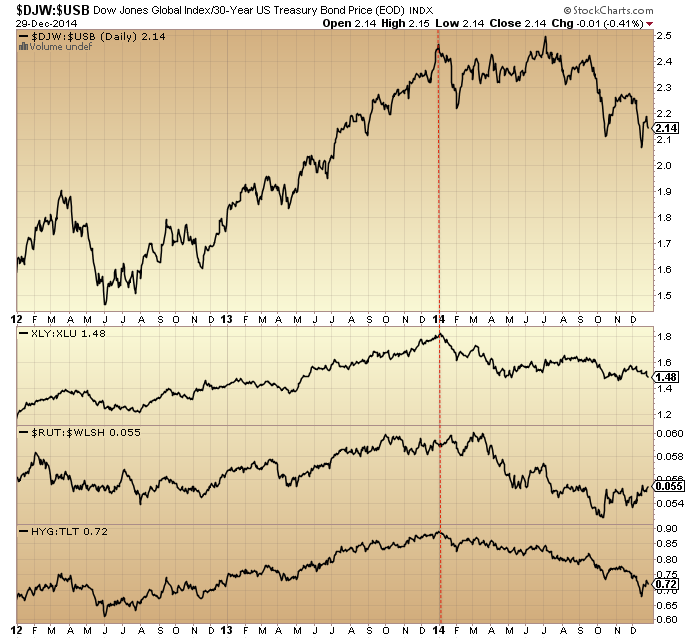 The trend fits Euro bonds better than US, but the implication is clear. when people start selling bonds (mid-1927) the money will propel stocks (and probably gold) much higher. Looking at sunspot numbers alone, we are already into early 1929, with the market due to peak around September 2015 (interestingly, that date is the same whether looking at an SSN or ISN comparison). Also, if SC24 percentage gains were to follow SC16 gains (as well as timing) – ie a +90% increase in US stock prices between SSN peak and market peak – then SP500 would be at 3450 by September 2015. Technical analyst JC Parets recently discussed the S&P. He remains bullish for 2015. Price remains inside a rising channel. IMO bears had their chance in October. A bearish rising two year wedge, QE switch off, perfect October window to mark a peak like in 2007. Yet bulls won through and turned it into a channel. Welcome back John and Seasons Greetings to All! Just in relation to Gold. i susbscribe to Jeff Kern who writes a regular article on 321gold. For those that are unaware he developed a mechanical/technical system over 30 years ago for predicting short to long term buy/sell signals based upon the global gold fund USERX. I have been a follower of Jeff for many years. Over ten in fact and his system whilst not perfect is IMO the best system ever developed for giving reliable and consistent signals on gold stocks and as such gold. In particular the SKI record for nailing MAJOR turns is virtually 100%. Now, to get to my point. …….I have said constantly that I have been accumulating gold stocks aggresively for several months and I continue to do so because I belive that they are the only sector in the eonomy that offer ANY form of long term value or acceptable risk/reward. Jeff Kern turned bearish gold stocks and gold in 2011 based upon several signals he obtained via SKI but not least of which was a run pattern of 2 down days followed by 5 up of over 10%. this type of run pattern is rare but is seen at major bottoms as well as tops. Jeff has been looking for a similar pattern,amongst other things, but in reverse ie,2 up followed by 5 down over more than 10 % to signal the end of the horrendous decline in gold stocks off the 2011 highs. Well just over two weeks ago that signal was obtained. 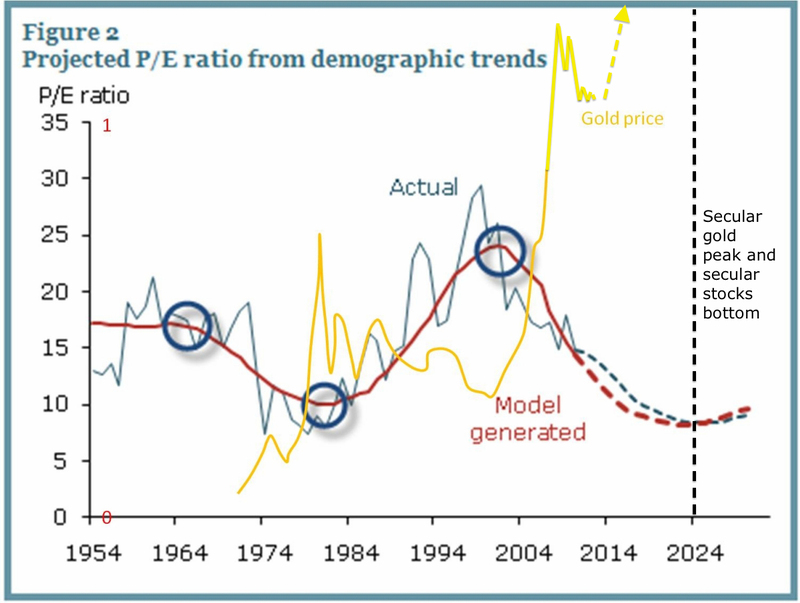 Based upon my assessment of long term factors in gold, including my belief that a major stock market rout will benefit gold and gold stocks as in 2000 and the SKI system itself, I believe that gold stocks and by proxy Gold, represent the best buy in over a decade and possibly in over 3 decades. I say that because the decline from 2011 to 2014 is very similar to the move in gold from 1975 to 1976. Those that bought gold and particular gold stocks in 1976 made obscene profits heaing into the major blow off in late 1979.
thanks Allan, started a long position early this week but the big down day a couple of days ago made me wonder i may be early…will check into Jeff Kern’s articles. the 2 down, 5 up pattern–how many of these has Jeff looked at? How many are on record? Same question for the reverse 2 up, 5 down, how many of these are on record historically? My concern would be that unless there are at least 25 or 30 such instances, the sample size is too small to give any reliability regarding its predictive value. pC, the SKI system can be back tested over 3 decades and is based upon the longest trading gokd stock fund in the world. 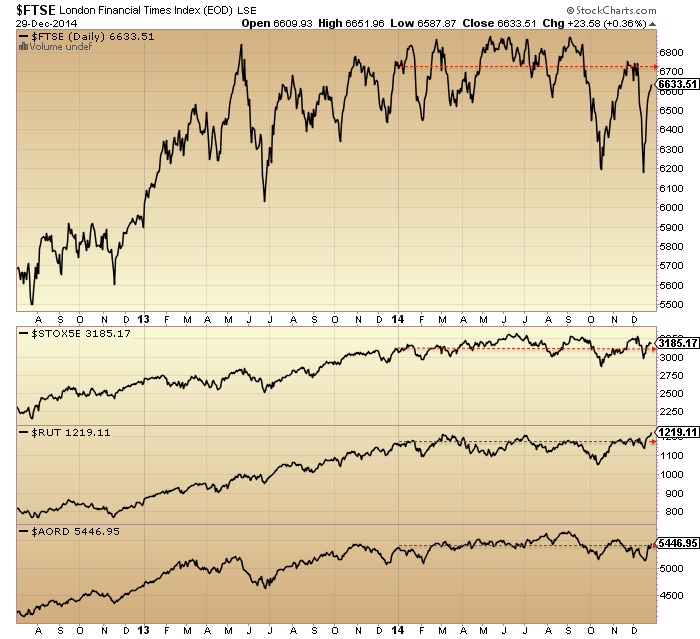 I can vouch for its timing in terms of picking MAJOR tops and bottoms. In regard to the run patterns a 2 up 5 down of more than 10% is very rare. You have to realise that this buy not based on a singular signal. More importantly Jeff uses run patterns in combination with a series of indices based upon back prices, based on previous trading days ie16-20, 35-39, 92-96 and so on upwards. It is these back prices, which when crossed in a particular pattern that give buy or sell signals. When given in combinatiin with run patterns, particularly one as rare as 2 up or 5 down( the 5 down of more than 10% to new lows) they have always as far as I have been able to confirm mark major tops and bottoms going back 3 decades. Jeff refers tomthem as “life run lows or highs”. The last was in 2011 at the top. I can’t say anything else other than I have followed SKI for over 10 years and whilst not perfect his system does and has worked to the degree that he has avoided every major decline and caught every run higher. At times he has received false signals but gets stopped out so as to incurr very minor losses. The system can be very confusing to many but it works. I know it works. So I am confident based upon his system and what I kow of history and markets that gold and gold stocks have bottomed. There has never been an instance in history to equal the level of fear that we just witnessed in the gold stock sector. That alone is goid enough for me. wouldn’t gold stocks also fall with a stock market meltdown? Brian I have discussed this before with others. This cannot be compared to 08. In 08 gold stocks were on thetail end of a long run and gold had also been rising. In the 30’s gold was regulated and only later revalued so how can you compare it to then? The best comparison to now is 2000 when gold amd gold stocks had been smashed to new bear market lows only to explode higher as the tech bubble burst. That is where we stand now.gold and gold stocks have been smashed to new lows and offer the only value when to stock buble bursts. It will arttact massive capital on a stock market sell off. Martin Armstrong for one has put the fear of God into investors over gold and yet back in 2011 he was talking $5000 gold prices in a few years. Now he blasts investors for talking of higher prices. Sure he got the decline right, but only well after the fact. Now he is talking still lower gold prices but as in tje last time he will be late to see the bottom. In 12 months time MA will finally join the bull camp. Agreed, I also noticed this about MA. He talks big because I think he charges a too much for his reports. The panic selling on 12/31 led to VIX filling gap while TRIN spiked above to 1.92. Historically this also points to a ST bounce. Allan, Thank you for that information on gold. I will look into Jeff Kern. My intuition says that there is something of value there. I have invested in gold and gold stocks starting in 1999 for reasons other than just market analysis. Bear with me here. We are suppose to be going into a “Golden Age”. This also means an age of gold. Where people will realize the spiritual qualities of gold and will start to use and accumulate it for the betterment of themselves and mankind. According to spiritual teachings – gold is precipitated sunlight!! It has a very high vibration, which is one of the reasons it has historically been so highly valued and used as money. And gold in our environments, in our hands, will help humanity to raise its consciousness, help transmute negativity and the downward spirals of our civilizations to reach this “Golden Age” we are destined for. 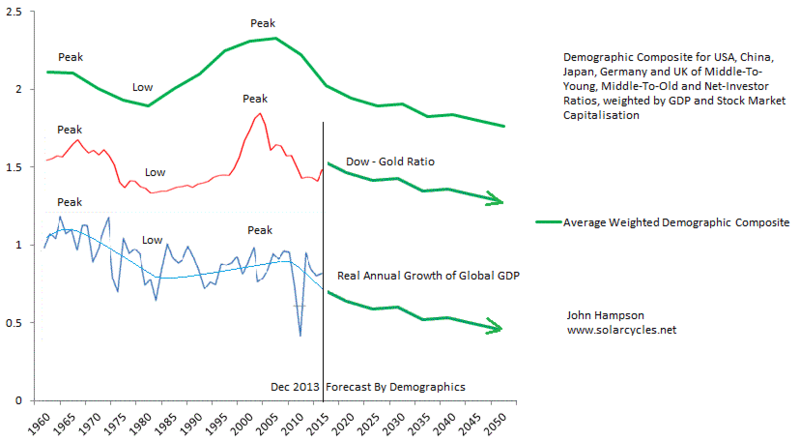 Maybe this is why the Central Banks don’t like gold. Too much gold in existence would raise the vibrations of earth and the lowly Central Banks and Banksters will no longer be able to exist. Mae, thanks for that. I can’t disagree with the fact that gold has a certain allure and always has amd always will. I also agree with the idea that gold is going to be seen once again as a significant vehicle to preserve wealth. I know many find it difficult to understand why or how gold is of importance in times of turmoil but history proves it to be the case, so why should I or anyone else think it shall be any different next time? Just in regard to Jeff, his system is quite involved and needs some devotion and time to understanding, however it is IMO the best system ever developed for giving reliable consistant signals on gold stocks. Like I said previously it can give ocassional false positives but it is usually quite quick to sell again thus stopping you out before suffering very much loss. The beauty is that it also gets you into the market very close to the bottom of what can eventually be mega moves of well over 500% and thus more than compensates for a few minor losses and also gets you out before major delines. SKI warned in advance of every major decline of the last 3 years. Pretty damn impressive IMV. The hardest part of the system is being able to adhere to signals as it is very easy to want to ignore some signals when euphoria or pessimism abounds. You have to at times, put emotion completely aside otherwise it will not work. $/¥ is going to new highs and stocks will follow. My targets are $/¥ 24, SPX 2170 and Gold 950. Apparently gold stocks fell heavily with the GM in the 30s,but did recover strongly and was then out of sync .I agree gold was regulated at that time. However 08/09 was a scary time to own gold shares. I think long term you will be well rewarded , short term not so confident. Good luck, I too am a gold bug. I think MA is onto something, but I really don’t think he knows how to interpret it.